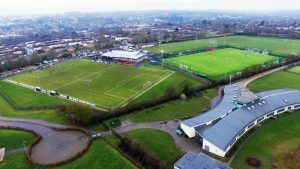 THE New Croft will be a hive of activity as it stages the Crown Imperial Youth County Cup Semi-Finals Day on Sunday. A total of 20 Suffolk FA county cup semi-finals will take place across the six boys’ and four girls’ age groups. The New Croft will be hosting the event for the second time in three years. The gates will be open from 9am with refreshments available all day. Crown Imperial Boys’ Under-12s Semi-Finals: Ipswich Valley Rangers Blue v Waveney Tigers (1.30pm), Kirkley & Pakefield Royals v Bury Town Colts (12 noon). Crown Imperial Boys’ Under-13s Semi-Finals: Moreton Hall Dynamo v Whitton Utd EJA (12 noon), AFC Sudbury EJA v Stowmarket Town EJA (10am). Crown Imperial Boys’ Under-14s Semi-Finals: Leiston EJA v AFC Sudbury EJA (2pm), Needham Market EJA v Brandon Town Community (4pm). Crown Imperial Boys’ Under-15s Semi-Finals: AFC Sudbury EJA v Wickhambrook (6pm), Needham Market EJA v Stowmarket Town EJA (2pm). Crown Imperial Boys’ Under-16s Semi-Finals: Needham Market EJA Green v AFC Sudbury EJA (6pm), Needham Market EJA Blue v Cornard Dynamos Blue (10am). Crown Imperial Boys’ Under-18s Semi-Finals: Ipswich Valley Rangers White v Bury Town Saints (12 noon), Bacton Utd v Ipswich Wanderers (4pm). Crown Imperial Girls’ Under-12s Semi-Finals: Coplestonians v Waveney (12 noon), Felixstowe & Walton Utd v Haverhill Rovers (10.30am). Crown Imperial Girls’ Under-13s Semi-Finals: Coplestonians v Ipswich Valley Rangers (3pm), East Bergholt Utd v Brandon Town Community (10.30am). Crown Imperial Girls’ Under-14s Semi-Finals: Beccles Town v Waveney Lionesses (1.30pm), Ipswich Valley Rangers v Felixstowe & Walton Utd (3.30pm). Crown Imperial Girls’ Under-16s Semi-Finals: Capel Plough v Waveney U15s Foxes (12 noon), Stowupland Falcons v Kesgrave Kestrels (10.30am). Suffolk Veterans’ Cup Semi-Finals: ETC Lowestoft v Woodbridge Town at Leiston St Margarets FC (2.30pm), Capel Plough v Whitton Utd at Old Newton Utd FC (2.30pm).